Chest stretches are important for the mobility of the shoulder joint. The exercise strengthens and stretches the chest muscles, the front part of the deltoid muscle, and the internal rotators of the shoulder. Moreover people that are suffering from a hunched back can ease their complaints with a regular chest stretching. We begin by lifting one arm up above shoulder hight. The hand and optionally the forearm rest on a wall or similar. From this position we rotate the trunk away from our arm until we can feel a stretch tension in our chest muscle. The tension can be intensified by stressing the outward rotation of the upper arm (elbow rotates inward) and the forearm (thumb points backward). It is helpful to take a high lunge position with your feet for the stretching. 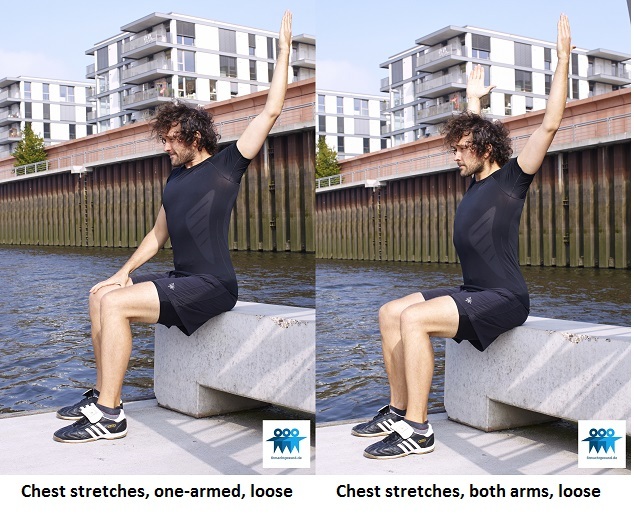 Chest stretches can also be performed with loose arms, preferably in sitting position. Here, we keep our abdominals tensed and raise either one arm or both arms to the same time. To achieve a stretch tension we rotate our upper arm backward (arm pulls back) as well as our forearm (thumb points backward). This variation is less intense compared with having your arms resting on a wall or similar. Both variations can focus on different parts of the chest muscle. 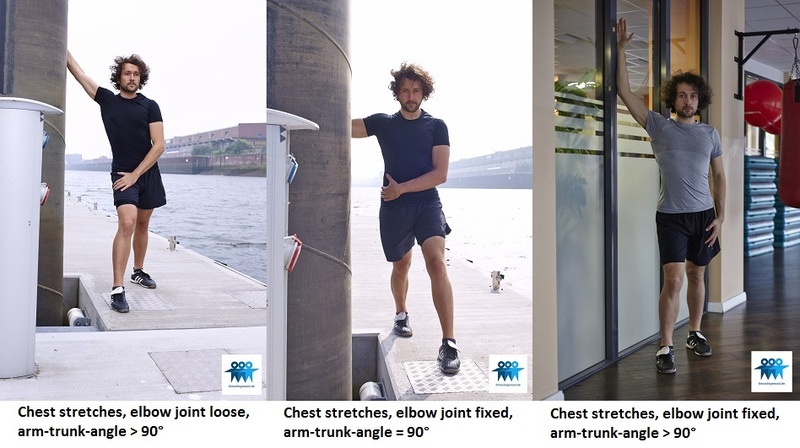 Raising up your arm far above an arm-trunk-angle of 90° stresses the upper part of the chest. Angles closer to 90° or even below focus more on the middle and lower part. Chest stretches also represent a stretching for the front part of the deltoid as well as the inward rotators. Learn about the different ways you can practise your stretching in the article types of stretching.